Outside the windows of General Assembly Boston, the sky and the buildings seem to blend together in shades of gray, but the energy among the women in attendance seemed to bring the space to life and add rays of light to the overcast evening. 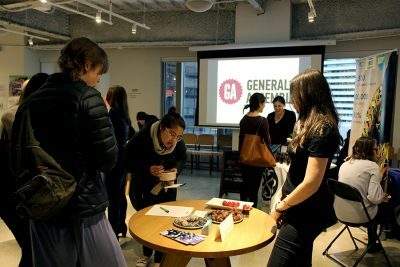 On Thursday, General Assembly, a local career development center, hosted a “Spring Wellness Expo” to showcase Boston wellness startups and inspire women to make healthy career changes and find happiness with their life choices. Tables filled the room, covered in business cards and pamphlets from various companies that offer wellness service, from superfood to artisan soaps to career counseling. Almost every table had a coupon of promotional item offered as a parting gift for visitors, ensuring that, at the very least, they would leave with a feeling of wellness in their wallets. General Assembly partnered with Just Us Gals for the evening, a lifestyle blog that offers insight on life, health and career opportunities for women around Boston. “We’ve brought together a bunch of service providers and product-based businesses that help people with their best lives here in the Boston area,” said Jenn Walker Wall, founder and career strategist at Work Wonders Coaching + Consulting. Many of the women present had attended at least one Ladies Lounge event before, and said they were excited to come to one specifically about wellness. Amy DalCanton, 23, of Newton, said she wanted to support female entrepreneurs. The night began with a guided meditation, courtesy of Vyda Bielkus, co-founder and CEO at Health Yoga Life, which she opened with her three sisters. The Bielkus sisters were inspired by their mother, who throughout their childhood would meditate every day. It’s what made her so present as a single mother of four, Bielkus said. One day, she saw a “for lease” sign in a window, and that was it. Bielkus left her graduate studies at law school and started a studio. The studio offers traditional yoga classes, but Bielkus said it also helps people look at their career path and find what makes them feel whole. Bielkus said she believes that just 20 minutes of meditation, twice a day, could change the life of every woman in attendance. Emily Cunningham is the co-founder and chief operating officer at True Moringa, a beauty company that uses Moringa oil that’s more natural than the fan-favorite of the beauty world, Argan oil. One of the women at the expo was a specialist in holistic health practices and coaches people who are thinking of changing their careers. Becky Shade is the founder of Wellness at Work, who decided to leave the restaurant business and pursue a career in wellness after developing chronic joint inflammation and other health issues. Shade said everybody deserves to find something that ignites their passion. “Whether wellness is your thing or not, you deserve to find what makes you come alive,” Shade said.